Simple one strong magnet holds with band firmly, no closure need, surrounding your wrist safely and neatly. Different colors available for choosing: Black/ Silver/ Rose Gold. Perfect match with your Apple Watch models. Please make sure about the size of the Apple Watch, you can see it at the back of the dial (38mm or 42mm), then you can choose S/M or M/L according to your wrist size. Simple and Sturdy: easy to install and remove just with one press at the back of the watch, Lugs on both side of the strap ensure a strong connection. Secure and Adjustable: No buckle needed, the strong magnet holds the band tightly. Flexible to adjust according to your wrist. Classic and Clean: Smooth Surface attained after repeatedly ground and polished of the steel material. Ensures a neat look and pleasant wearing experience. 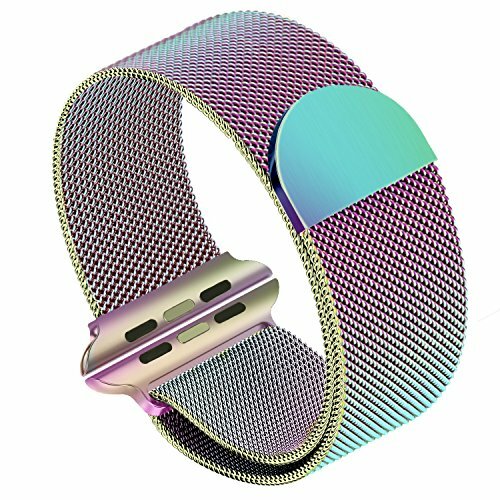 Compatible Models: suitable for Apple Watch Series 1/ 2/ 3. Size adjustable to fit 6.15"-10.35" (156mm-262mm) wrists. Warranty: 12 months warranty after the date of purchase, 100% replacement or refund for all quality-related issues.